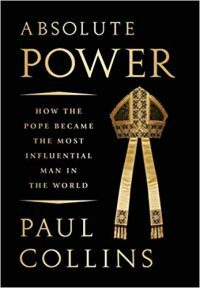 Early in “Absolute Power,” Paul Collins says 1799 “was probably the lowest point in the history of the papacy.” What follows is a look at Catholic history as shaped by world affairs, the institution of the papacy and its power, and how the successors of St. Peter from the early 19th century through Pope Francis have used that power. The abundance of scholarship and detail in this work gives the reader an education that should move them to do further study. Among the topics that lend themselves to further study are the First Vatican Council, Americanism, modernism, papal encyclicals and, of course, power. He sees soft power as a diplomatic approach in which the Vatican enters into situations where, for example, it can promote peace between warring nations. Collins is adamant in his opposition to the centralization of power in the papacy, focusing much of his commentary on what he sees as the need for decentralization of papal power — decentralization that focuses upon more power being given to local bishops and the Catholic faithful themselves, with the latter even being involved in the election of bishops. Collins’ profiles of each pope are engaging, but readers, beware. His profiles are more than facts about and circumstances surrounding the men and the times during which they led. Each is subject to Collins’ views about the popes. Thus, one is advised to read other sources to obtain a fuller understanding of each pope and his pontificate. This is particularly true when it comes to the author’s examination of St. John Paul II. The chapter’s title, “The Polish Colossus,” indicates how harsh his treatment of that pope is. One might wonder whether the viciousness of the attacks is due, to some degree, to the author’s book, “Papal Power,” being the subject of an investigation by the Congregation for the Doctrine of the Faith between 1997 and 2001 — a fact Collins acknowledges. Two editing errors of note. One is giving the title “cardinal” to the late Archbishop William D. Borders of Baltimore. He was not a cardinal. The other is in Collins’ use of “deaconate” when he is writing about the diaconate. There is certainly value in reading some of what Collins has to offer. He places the service and impact of the popes in a historical, universal context. While some might find merit in his views about the popes and how power in the church should be distributed, they are reminded that they are just that — his views. Readers are encouraged to form their own. Olszewski is the editor of The Catholic Virginian, newspaper of the Diocese of Richmond, Va.